Crazy weather. 33 degrees in Germany and 14 degrees in England and in between thunderstorms in Holland and Belgium. After poor conditions there was the mother of all static on the bands tonight! 6241 @ 1459 Digital AM - 35333; Test : "Trouble In Paradise" by J. D. Souther. 6321 @ 1656 Ascona - 34333; Test ID and said 10 watts output, Robbie Williams and "Candy"
6245 @ 2046 Mazda - 45333; "Ich Hab' Dir Nie Den Himmel Versprochen" by Andrea Jürgens, "Veronica"
6285 @ 1824 Python - 45544; Golden Life "Oprócz błękitnego nieba"
6323 @ 1855 Pandora (UK) - 24333; Promo from Cool AM, Speech in English, Pandora ID and jingle, "Old Red Eyes Is Back" by The Beautiful South, 34333 @ 2028 and Deep Purple with "Smoke On The Water"
4025 @ 2049 Laser - 34333; Paul McCartney & Wings & "Band On The Run"
Solar activity was sufficient to prevent short / medium skip on the 48 metre band throughout the day and evening. Signals were only being heard beyond about 500 km, maybe more. No Western European stations were heard at my location. 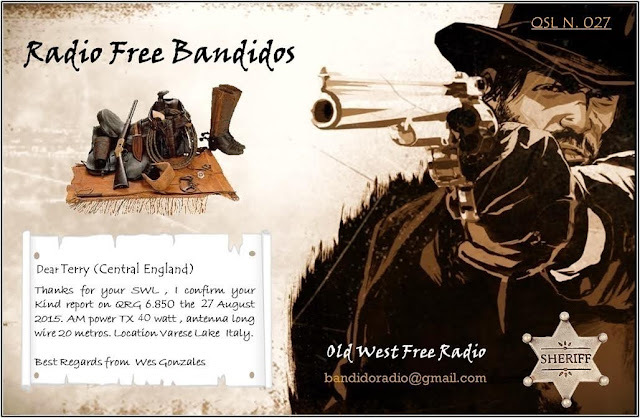 Listeners in Norway, Spain and South - western France reported reception of some stations from the Netherlands. Medium Wave was quite good. From this Friday, Radio Maria and Radio 5 will leave the MW for good. 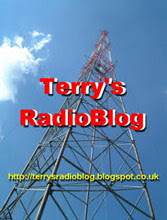 This will affect the Radio 5 transmitters on 747 and 1251. Maria's MW outlet is 675. Alternatives include DAB+ and the Internet. Not much good in the car though! Listeners beware: The regular program of NPO Radio 5 can no longer be heard from Saturday morning through the AM"
After September 1 Radio Maria Netherlands can be heard exclusively digitally. The Catholic radio station disappears from the medium wave (AM) but continues to be received via DAB+ and the internet"
No more bobbing about in “pirate” boats on the North Sea or shimmying up urban tower blocks to fix an FM aerial: today’s radio rebels broadcast from coffee bars, record shops and restaurants, commanding global online audiences – and working within the law. Online stations are now transforming Britain’s radio sector with their specialist knowledge and unique choice of location. A prime example of the movement is MEATtransMISSION, which operates from the upstairs of a burger restaurant in Hoxton, east London. The station not only broadcasts to diners across the MEATliquor restaurant chain but attracts online listeners from 130 countries and follows rules which might not be recognisable to Ofcom, including: “no bongos”, “no hippies” and “no Coldplay”. 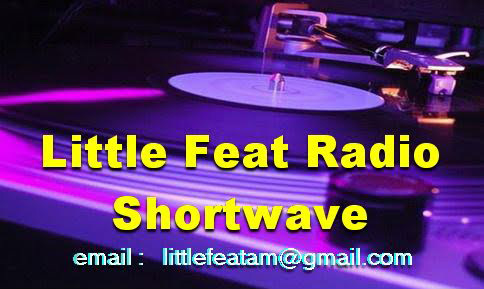 6200 @ 1928 Shortwave Radio 00 - 34333; Carly Jepsen & "Call Me Maybe"
6285 @ 1810 Hitmix - 33333; BZN - "Just An Illusion"
6280 @ 2040 Lowland - 35433; Feargal Sharkey & "A Good Heart"
4025 @ 2134 Laser - 35434; Supertramp and "Fool's Overture"
4025 @ 2209 Laser - 34333; SWV and "Right Here"
I also heard Monte Carlo on 1645 in QSO, but did not take details. Conditions were not good this evening: noisy band due to thunderstorms in Western Europe and an early close down for short skip which serves to remind us that Autumn is almost here! 6285 @ 1734 Rode Adelaar - 3-45434; Andre Brasseur - "Big Fat Spiritual", Paul McCartney & Wings - "Band On The Run"
6215 @ 2005 Oscar Zulu - 34333; Rah Band - "Clouds Across The Moon"
When the Shortwave band is closed or there are no active stations, I often scour the internet for new stations to add to my saved list on the Denon Network Player. I came across a new station the other day and have been listening to it since. It is a former independent commercial radio station called "Celtica Radio". This station has an interesting history: http://www.celticaradio.com/aboutus.html and a long list of experienced presenters. As I understand it, Celtica plays only music from established and new artists that is out of the jurisdiction of the Performing Rights Society, or Phonographic Performance Ltd. Many UK stations on the air do not succeed in sounding like they are in any way local, being the output of large commercial enterprises. Celtica sounds to me like a station that would deliver that elusive local feel to the target audience in Bridgend and Wales in general. I did a list of all the "free" stations heard by myself in the 6mHz shortwave bands during July and came up with the following totals. I did not include stations like Laser where the location is uncertain, disputed or unknown. Not surprisingly, the number of stations heard from the Netherlands was the biggest again. 6470 @ 1803 Tower - 3-45444; "I'm Free" - The Rolling Stones, "Live & Die" by Orchestral Manoeuvres In The Dark"
6267 @ 2008 Radio 42 - 35434; ID, Four Tops - "Loco in Acapulco"
Radio Montferland, Radio Mustang and Abu Dhabi Radio were heard in Brazil! Further reading of HF Underground tells of a Brazilian DXer who has heard these stations on a Tecsun S-2000 and 400m longwire antenna!